Nothing adds more to the look of your golf cart than custom tires, wheels, and custom wheel covers. These are some of our most popular items and we offer only the highest quality. Dress up your plain-jane golf cart with 8-inch, 10-inch, 12-inch, or 14-inch wheels and tires. Larger tires are available for golf carts that have been lifted with our lift kits. 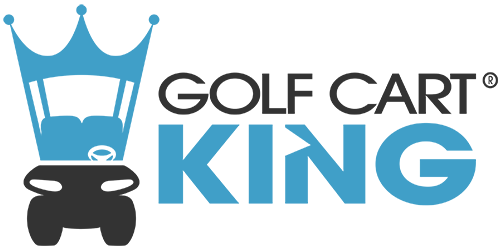 Golf Cart King can also help you find the best combination of wheels and tires depending on how you drive and use your golf cart. Why take a chance driving on old and worn-out tires when we have a full collection of premium replacement tires? Our replacement tires are a big upgrade from stock tires, and they come to you ready to be mounted. We also carry larger tires including 22X10-10, 22X11-10, and 22X9.5-10. Our line of center caps and lug nuts come in a variety of sizes and colors. We stock the best and most reliable manufacturers of these products. They will fit all of the top name brand golf carts. If you plan on traveling to the woods for a hunting trip or an off-road excursion, you need the right lifted wheel and tire combination. Some wheels and tires are suitable for pavement driving, and others are more geared towards rougher terrain. These combos are offset so that they do not rub against the fender wells of your golf cart. Our low profile tires and wheels will give your golf cart a distinctive look. Our low profile steel wheels and hubcap sets stand out with a more upscale style. If you are looking to extend your wheelbase, wheel spacers give you the ability to mount larger tires or give your golf cart the stance you prefer. The majority of our wheel spacers are cast from solid aluminum for extra strength and added durability. We have 1, 2, and 3-inch wheel spacers for all of the top name brand golf carts.